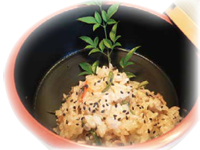 Sansai Okowa is very flavorful, heart-warming, traditional Japanese rice dish. We use Japanese rice and sweet rice, harvested in our local, Mie-Prefecture along with domestic chicken. Shiitake mushrooms are cultivated in the near-by prefecture of Shiga. 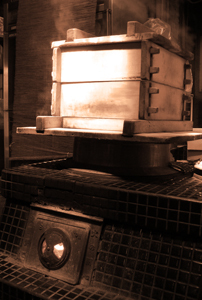 Steamed using traditional hearth, which offers high heating power, Okowa gives soft and sticky mouthfeel. The soup stock of our Soba is extracted carefully from Hidaka-Kombu of high quality and shredded bonito with four kinds of soy sauce. Vegetable dishes and pickles are made of locally grown produce. Most of our staffs are trustworthy local wives. We aim toward using local foods to welcome our guests with homemade dishes. Akupita is the cooking utensil, invented by the late owner chef of Aizuya. Akupita is used to remove the scum or to get rid of harshness from liquid such as chicken broth, which results in refined taste in any food. The special structure of Akupita makes the process of scum removal very easy and quick.